« Special History in the News Update: What’s Happening to Egyptian Treasures? I occasionally run across a book that challenges me; that makes me work for the story and enjoy the labor; that awes me with the craft of the writing. Usually these are considered “literary novels.” I also find a lot of literary novels tedious, because I’m partial to plot-driven stories. But Latro in the Mist surprised me. It’s a fantasy novel with gods and ghosts (which may not be real, see my discussion below.) It’s a historical novel about real events set in Greece in 479 B.C., and populated with historic characters. It’s also a finely crafted literary novel that makes the reader think beyond the story and characters about the nature of memory and self, friendship and loyalty, and the journey that is life. 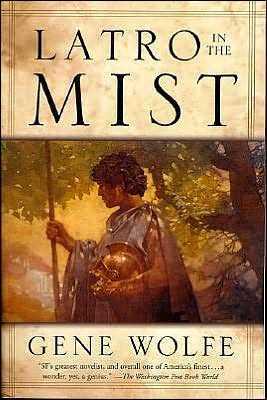 Latro in the Mist is an omnibus of two books Soldier of the Mist (1986) and Soldier of Arete (1989); a chunky 623-page (with another 16 pages of glossary) doorstop of a book, but well worth plowing through. Gene Wolfe provides a compelling literary device to keep the reader engaged. The books are the “translated” scrolls of Latro (which can mean brigand, guerrilla, hired man, bodyguard, or pawn), a Roman mercenary who fights for the Persians in their war against the Greek city states. In the first chapter we find that he has suffered a head wound and doesn’t remember things that happened the day before. A healer gives him a scroll and lead stylus to write what happens from day to day, so he can “remember” by reading his own history. As with all curses, there is a blessing: Latro can now see and talk to gods, ghosts, dryads and other mythic creatures. A seer in the temple of “The Shining One” tells him that he has offended a goddess and must return to her temple and make amends. Thus Latro leads us on a fantastical journey, as he seeks a cure for his affliction, and a way to return to his dimly remembered home. He is captured by the Greeks and taken as a slave; makes friends with poets, merchants, whores and generals; loves an Amazon; travels the breadth of Greece and her Asian colonies; fights when necessary; and competes in the Olympics where he wins the urn that his scrolls are later found in. For those who like their historical fiction unadulterated, I still recommend this book. Latro is involved in actual historic events and interacts with several historic characters, including the poet Pindar and the Spartan general and regent Pausanias. In fact, knowing the real history considerably enhances the story, because it is by nature episodic and sometimes skips several days when Latro is unable to write anything. Occasionally someone else “writes” in the scroll and fills in some details that Latro has forgotten, but these are few and far between. Having some knowledge of the events of the time helps fill in the gaps. It’s this episodic nature coupled with the unreliable narration and fictional translation that makes the reader work to keep everything straight. In summary, I very much enjoyed this book. I was familiar with Gene Wolfe’s reputation in the science fiction/fantasy world, but had never read any of his work. Latro in the Mist has made me a fan. But it’s not for everyone. If you like your story straightforward, this omnibus will drive you crazy. If you like puzzles and don’t mind a little mental workout, you’ll love this one. Ha, Faith, you beat me to it! I’ve had Latro in the Mist on my shelf for more than a year – it was recommended to me as the best book a fellow poster on RomanArmyTalk had ever read. When anyone tells me that, my antennae go up, especially when I’d read Wolfe’s Torturer quartet of books as a teenager, and rated them highly. I will now do my best to get to reading it sooner. Thanks for an informative review! You’re welcome, Ben. I haven’t read anything else by Wolfe, but this was brilliant! Gene Wolfe is wonderful. He’s famous for unreliable narrators, and everything he writes makes you think, makes you work for it, his books change everytime you read them. The guy is an absolute genius.